International Journal of Research in Health Sciences,2015,3,2,235-240. 1-Associate professor, 2-Resident, 3-Professor, S.B.K.S.M.I. and R.C, Vadodara. Department of General Surgery, Gujarat, INDIA. Background: Diabetic foot ulcer is a major complication of diabetes mellitus, and probably the major component of the diabetic foot. It occurs in 15% of all patients with diabetes and precedes 84% of all lower leg amputation. Major increase in mortality among diabetic patients, observed over the past 20 years is considered to be due to the development of macro and micro vascular complications, including failure of the wound healing process. The etiopathogenesis of diabetic foot lesions are multifactorial. Diabetic neuropathies, vasculopathy, poor control of diabetes and bacterial infection are some of them. Colour Doppler imaging is safe, popular, cost effective, repeatable, non invasive procedure for investing lower limb arteries. Material and method: This is an analytic study of role of colour Doppler in management of diabetic foot. The study was carried out in 40 cases admitted in Dhiraj hospital from May 2011 to September 2013. The duration of Diabetes & disease-specific and/or procedure-specific complications were also recorded to leverage the findings of the study. 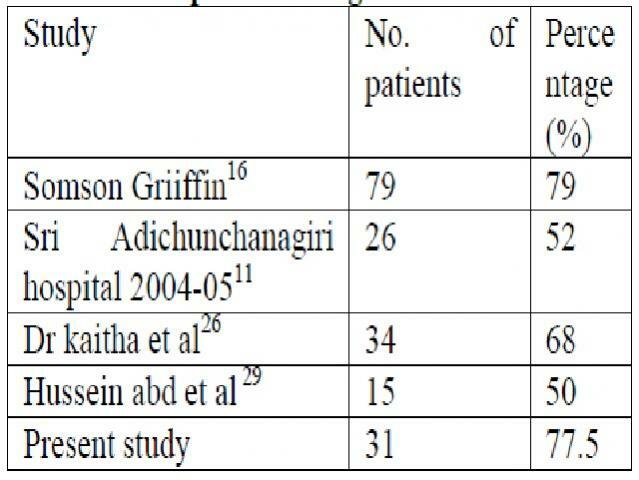 Results: In the total of 40 patients who suffered with diabetic foot lesions, 75% were in middle age group between 41-60 years, 67.5% were males with majority of patients having some kind of history of injury for the beginning of diabetic foot lesions. 27 out of 40 had positive colour Doppler findings of arterial stenosis. 10 out of 27 had raised serum cholesterol and triglycerides. Out of these 10 patients, 8 patients had total occlusion. Conclusion: The study showed atheromatous plaque changes with significant stenosis/occlusion among the patients with diabetic foot lesions in whom colour Doppler is safe, non-invasive, repeatable and primary modality of choice for screening vascular changes and determining the line of management in these patients.